Bishop Katharine Jefferts gives the final blessing at the closing Eucharist on the 10th and final day of the 76th General Convention. Bishop Mark Hollingsworth is interviewed by the local news media in Anaheim. 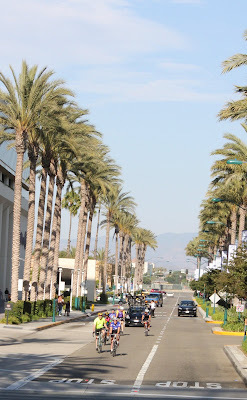 The Convention is over and the Ohio bikers prepare to start their journey from Anaheim to New York City! 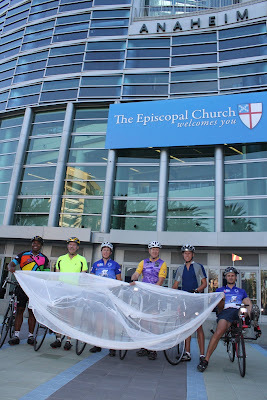 The Anaheim Convention Center welcomes the Episcopal Church! 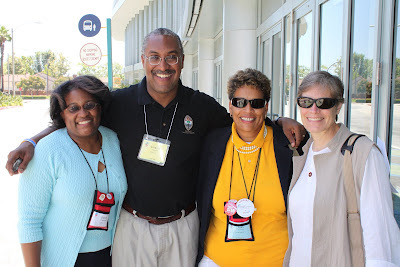 Members of the Episcopal Diocese of Ohio enjoy the hospitality of our neighbors to the south, the Episcopal Diocese of Southern, Ohio: L to R: Sue Perkinson, Bishop Arthur Williams, Yorki Encalada, Lynnette Williams, Percy Grant. Mr. Secretary Day at the General Convention. Young deputies and members of the official youth presence demonstrate their affection for Convention Secretary, the Rev. 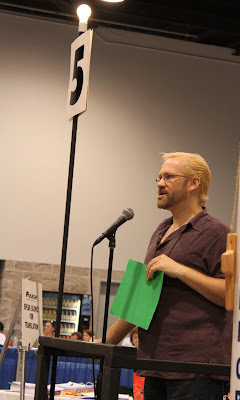 Dr. Gregory Straub by "imitation" the highest form of flattery. 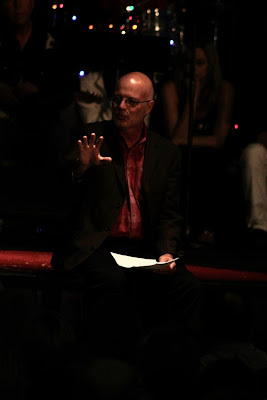 Emergent Church Guru Brian McLaren offers a homily at the daily community Eucharist on July 16th. 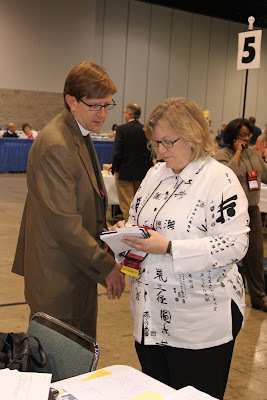 Dr. Bonnie Anderson, President of the House of Deputies signs a prayerbook for Ohio Deputy Bill Joseph. Ohio Deputy Selnick prepares our deputation's daily prayer-focus point: nativities from around the world. 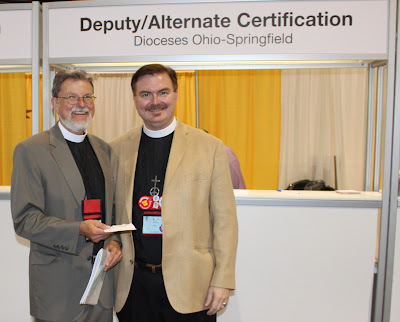 Ohio Deputy Gay Jennings with the vice-president of the House of Deputies, the Rev. Brian Pryor. 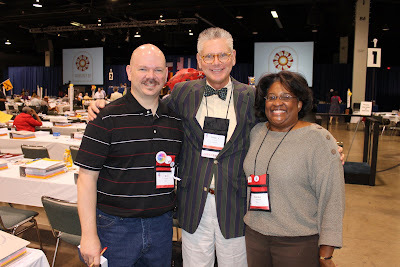 Ohio Deputies Joseph and Caywood with "Mr. Secretary" the Rev. Dr. Gregory Straub, Secretary of the General Convention. 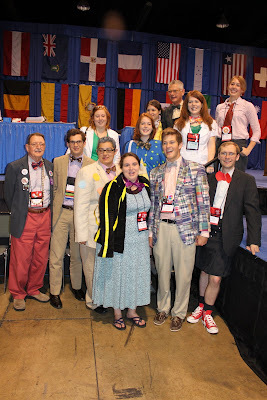 Dr. Straub is known for his colorful jackets and bow ties which change daily during the convention. 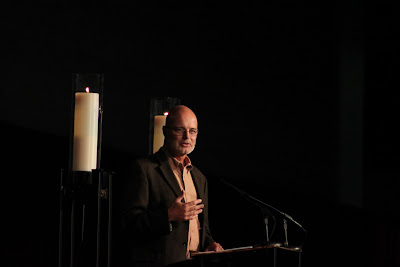 Emergiant Church guru Brian McLaren offers a meditation at the L.A. Night event sponsored by the Diocese of Los Angeles at the Anaheim Arena on July 15th. Bishop Jon Bruno of Los Angeles blesses water for a reminder of our baptism at the L.A. Night event "Genesis: From Breath to Wonder" on July 15th at the Anaheim Arena. 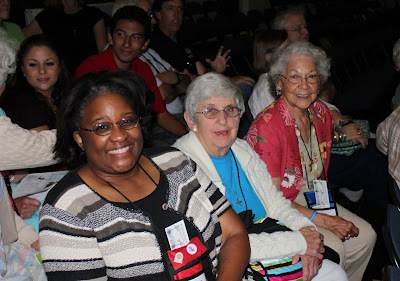 Ohio Deputy Caywood with ECW Delegates White and Stewart at the L.A. Night event sponsored by the Diocese of Los Angeles on July 15th. Deputy Wilbert from Ohio with the Most Rev. 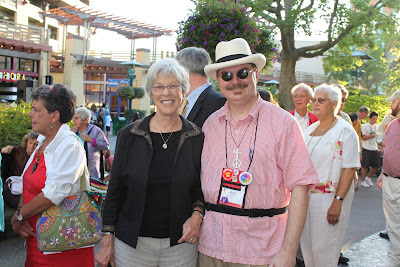 Katharine Jefferts Schori at the L.A. Night event sponsored by the Diocese of Los Angeles on Wednesday July 15th. Ohio Deputy Gracey offers a response to an inquiry about the Communications Committee during the second session of the 8th legislative day on July 15th. Deputy Jennings from Ohio offers a response to an inquiry about the work of the World Missions Committee during the 2nd legislative session of the 8th day on July 15th. 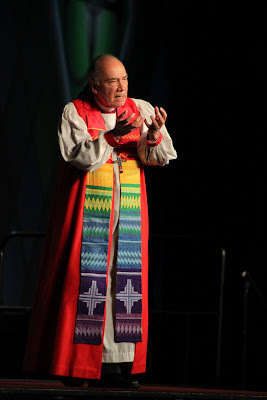 Another point of view greeted convention goers every day between 10:30 a.m. and 1:00 p.m.
Bishop Steve Charleston, Assisting Bishop in California preaches on Ubuntu in Action: Creation Care during the daily community Eucharist on July 15th. 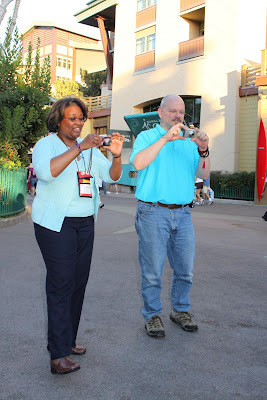 Ohio Deputies Denise Caywood and Bill Joseph have a photo op moment on the streets of "downtown" Disney before the Province V dinner on July 16. The Rev. 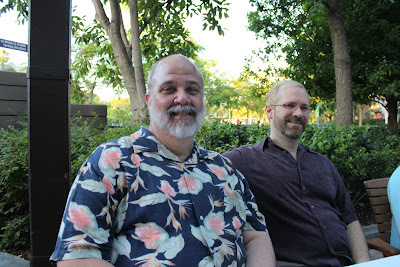 David Bargetzi and Stephen Gracey at the Province V dinner in "downtown" Disney on July 16th. 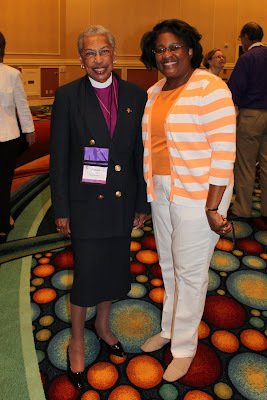 Dr. Bonnie Anderson, President of the House of Deputies and a member of Province V with the Rev. Dr. Brian K. Wilbert, a member of the Ohio Deputation at the Province V dinner in "downtown" Disney on July 16. 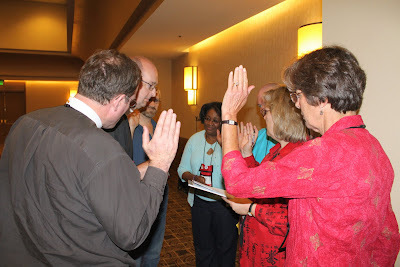 Members of Ohio's deputation vote during a meeting of the Province V deputations. The Rev. Conrad Selnick speaks at the Province V deputations meeting at the Anaheim Hilton. The Rev. Alan James presiding over a meeting of the Province V deputations. Our brothers and sisters deputies from the Diocese of Southern Ohio! 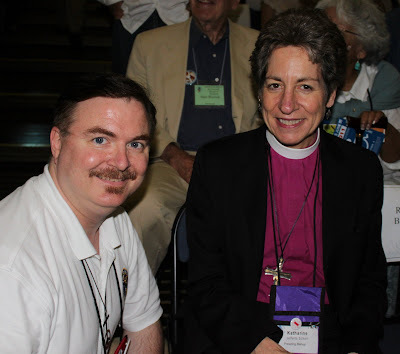 Ohio Deputy Denise Caywood with former Ohioians, the Rev. Gregory Jacobs, the Rev. 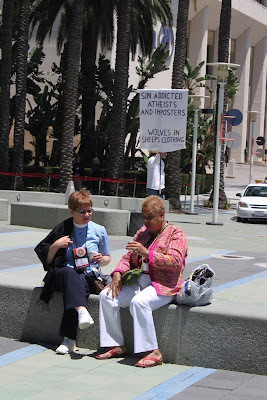 Lynn Collins and an unidentified convention guest outside the Anaheim Convention Center after a daily community Eucharist. 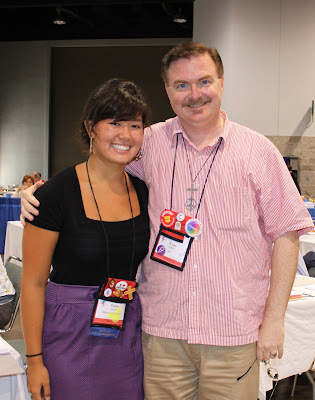 Grace Aheron, part of the official youth presence and an Episcopalian from Virginia who will be attending Oberlin College in September 2009 with the Rev. 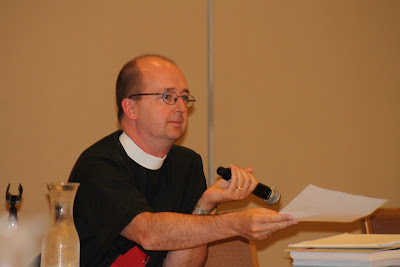 Brian K. Wilbert, Rector of Christ Church, Oberlin. An Abrahamic blessinging offered and sung by The Rev. 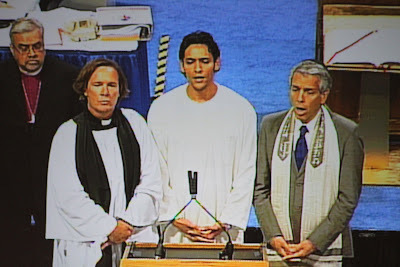 Peter Rood of the Episcopal Church of the Holy Nativity, Mu'athin Ben Yousef of the Islamic Center of Southern California, and Cantor Mark Saltzman of Congregation Kol Ami in Los Angeles. 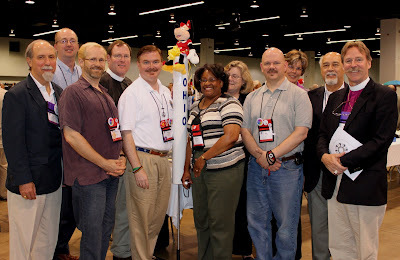 Yesterday, the Joint Standing Committee on Program, Budget, and Finance presented their proposed budget for the 2010-2012 triennium for the Episcopal Church. It was grim. The revenue has shrunk because of the state of the global economy and expenses have risen, which is no surprise to the millions of households experiences the same pressures. 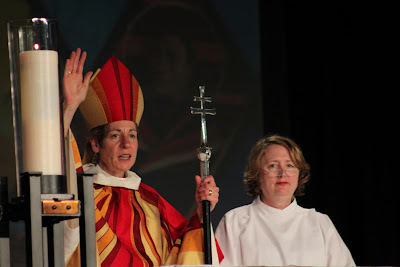 As a result, there are drastic cuts to effect a radical change in how the Episcopal Church will be working out its mission, with more emphasis on the mission and less on administration. There will be many people in the Episcopal Church Center who will lose their jobs. Pray for them. I have been laid off four times in my career, and it is devastating. Pray for all who have lost their jobs in our current economic crisis. 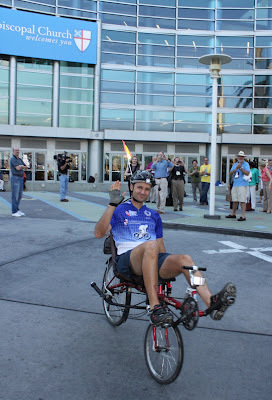 "Mission" has been much talked about at this General Convention. I grew up in the Presbyterian Church, and "mission" was always a central focus of our congregation's life. When I hear "mission," however, the next words seem often to address issues affecting people not in the United States. 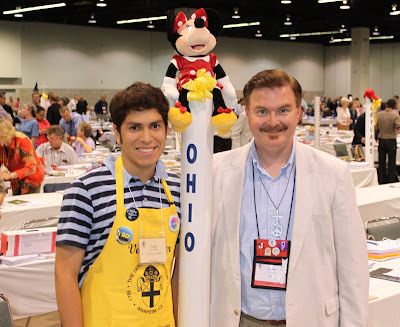 David and I went through the exhibits hall this week, looking for educational and liturgical resources that we could use at St. Luke's, Cleveland, where more than half our membership are under age 18, and almost all of them are people of color and poor. As we searched for pictures of people who "look like us" at St. Luke's, we either found no people of color in the photos, or they were wealthy people of color--cleaned up, well-dressed, and quiet. Those children who were clearly not well-dressed and quiet seemed always to be not in the United States. Lots of our young people at St. Luke's are deep, rich, chocolate brown, dressed in the most current urban styles--ball caps, long shorts that are worn low on the hips, t-shirts with abstract graphic designs, and hoodies. They have their cellphones always at the ready, and they sometimes forget to mute them during worship. (We all forget sometimes.) They are clean, well-dressed, and (mostly) quiet, but we couldn't find any pictures of them in the exhibit hall. They are also almost all from single-parent, poor families. They love Jesus, and they love our church. On the floor of the House of Deputies yesterday, there was a regular--though not exactly continual--sound of a child from the visitors' section, probably an infant. The child made squeals, but it wasn't crying. I only noticed because deputies around me were growing increasingly tense, and I was asked whether that sound wasn't making me crazy. It was the first I had even heard it. I think I didn't hear it because St. Luke's is not a quiet parish. We worship in the round with chairs, and there are often little children roaming around and making child sounds. When parents visit for the first time with their youngsters, and they sit worried and trying to "shoosh" their children, we go to great lengths to tell them that we really don't mind. They can relax: We'll help them keep their children safe because there is a place for them in our congregation. 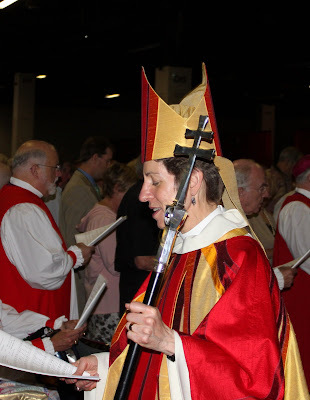 My Sisters and Brothers in Christ, I'm trying to make several points here today, the ninth day of the 76th General Convention of the Episcopal Church. Who we have been as the Episcopal Church--from a cultural point of view--is not who we need to be as we move closer to the Realm of God. We can no longer be the all-white, all clean, all well-dressed, all properly quiet folk all in our own, private pews we have prided ourselves on being in the past. There are fewer and fewer people like that in our society, and those who are like that mostly don't want to be with only others of their class and kind. They want the richness of difference, the experience of being changed. The poor, the people of color, and the people who need the prayers and missional support of the Episcopal Church are not only outside of the United States: They are also right next door to us at home, our neighbors. 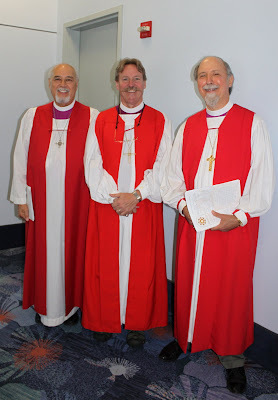 Pray for us in the Episcopal Church that we not only serve the poor, both in the US and abroad, but that we invite them into our congregations. Pray that we can be open to being changed by them, so that we don't regard them as strangers--strange to our ways--but as our family, strange as we ourselves have become strange and beautiful. It's the only way for us to grow: By opening ourselves up to the strangeness, so that it no longer seems strange, but just like home. The Rev. Conrad Selnick, The Rev. Lisa Hackney, The Rev. Percy Grant, The Rev. Alan James. Switching Credentials: The Rev. Gregory Sammons, alternate deputy and the Rev. Brian Wilbert, deputy switch credentials before Sunday afternoon's legislative session. UTO Ingathering and Eucharist July 12, 2009: Former Presiding Bishops Frank Tracy Griswold (#25) and Edmond Browning (#24). 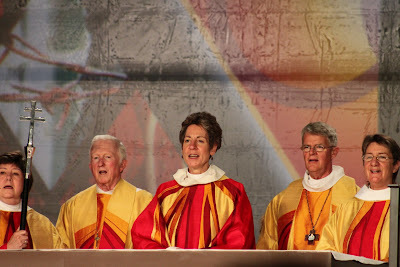 UTO Ingathering and Eucharist July 12, 2009: An historic first-The 26th Presiding Bishop, Katherine Jefferts Schori with former Presiding Bishops Edmond Lee Browning (#24) and Frank Tracy Griswold (#25). UTO Ingathering and Eucharist - July 12, 2009: Our Diocesan UTO Chair, Susan Lau presenting our check from Ohio to the President of the House of Deputies, Bonnie Anderson and the Presiding Bishop Katharine Jefferts Schori. 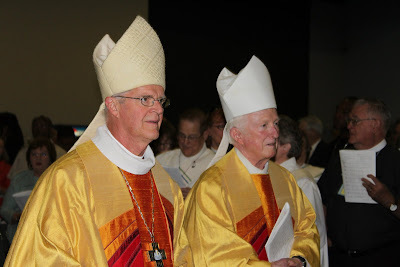 UTO Ingathering and Eucharist - Sunday July 12th: Former Presiding Bishops Frank T. Griswold (#25) and Edmond L. Browning (#24). Our southern neighbor and colleague: The Rt. Rev. 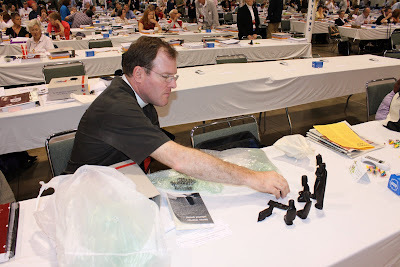 Tom Breidenthal, Bishop of Southern Ohio. Whereas the House of Deputies & the House of Bishops are completely concerned with legislation, we ECW members in the Triennial Meeting have the opportunity to learn about a number of Outreach activities and to attend some outstanding workshops (which are giving us many ideas to share at home). On Monday, July 13th, we had a wonderful presentation by Dean David du Plautier, the Dean of the Cathedral in New Orleans. He gave a PowerPoint presentation & told us about his vision of restoring the Central City--the area of New Orleans adjoining the Cathedral--which has evolved into the Jericho Road Episcopal Housing Initiative. He further envisions this as a program which can be duplicated throughout the U.S., wherever there is blight and areas in cities which need restoration. (doesn't this sound like something from which Cleveland could benefit???!!) 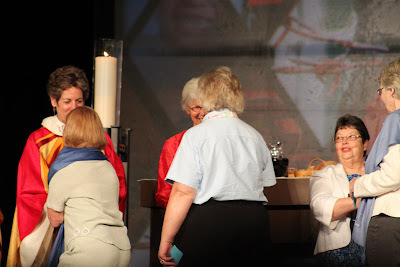 As of July 13th, the Episcopal Church Women have raised $73,080.55 toward our goal of $110,000. Elizabeth von Trapp also spoke to us this morning, saying that she wants to work with the ECW --- "use me to make a difference" -- saying that Jericho Road has an answer and she has a voice. The report that we heard from the ECW's Social Justice Committee told us about some of the Outreach gifts we've given: to the Mother's Union in the Diocese of Lui (Sudan) for a poultry farm; a partial scholarship to a handicapped young woman for art school; the Diocese of Kajo Keji (Southern Sudan) for their Tailoring Center; the Diocese of Haiti for their school which is teaching sewing & marketing skills; the Diocese of Puerto Rico for their Cathedral School program for the prevention of violence against women; the Diocese of Navajoland to buy heavy duty sewing machines & materials so the women can continue making blankets to sell as well as teach younger women. During this Triennial Meeting we have brought gifts for a local Outreach program--Project Dignity, which helps & supports families that have been forced to live in motels. 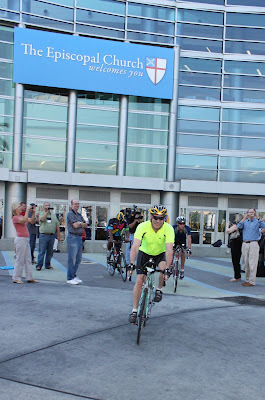 Rob Radtke, of the Episcopal Relief & Development, spoke to us and talked about our own Bishop's marathon bike ride (along with 8 other Ohio bike riders) "Riding for Their Lives" to raise money for Nets for Life. Rob was also able to tell us that the 0.7% line item has been restored in the national church budget!! 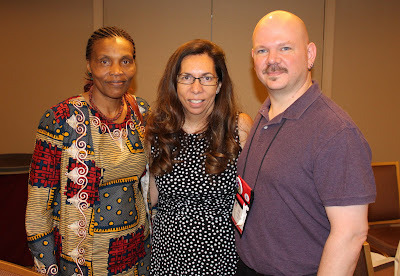 The Triennial meetings also hears from such people as Sarah Eagleheart, the Program Officer for Native American Ministry and Susan Johnson, president of the Episcopal Women's History Project. On Tuesday, July 14th, we heard the United Thank Offering report--explaining their criteria for their granting process and noting some of the 2009 grants. These were then approved by the Triennial Meeting. (we had spent time in a UTO hearing on Sat. 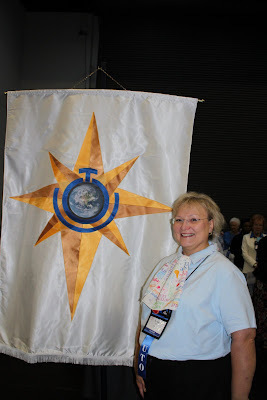 learing many details) The Offering at the Eucharist on Sunday totaled $28,168.92; so the total amount granted at this Triennial was $2,065,472.43 for 63 grants!!! 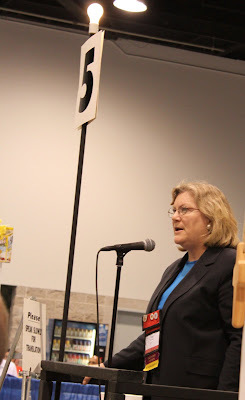 Bonnie Anderson, the President of the House of Deputies, spoke to us yesterday, giving us her vision of keeping her eye on the prize, and pointing out that the Episcopal Church Women keep their eye on the prize! --- Mission!! We had two more "blocks" of workshops in the afternoon. Yesterday July 13th Resolution D025 “Commitment and Witness to the Anglican Communion” was amended and passed in the House of Bishops by a vote of 99 to 45 with 2 abstentions. 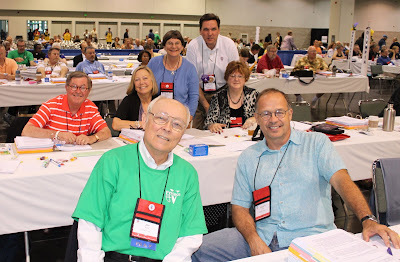 Today, July 14th Resolution D025 came back before the House of Deputies where again it was acted on by a vote by orders (the most conservative way for the Episcopal Church to vote in convention). After several attempts to amend it and after a full compliment of debate the vote was taken and the result is that the House of Deputies concurred with the House of Bishops. The votes in the affirmative to concur were 78 votes in the Lay order and 77 votes in the clergy order. So the Resolution passed by 2/3 vote by all Bishops, Clergy Deputies and Lay Deputies attending the 76th General Convention. 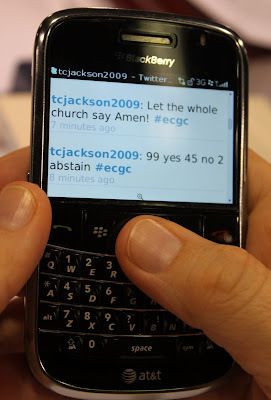 Some here are saying that Resolution D025 is a response of our church to Resolution GC2006 B033. Some here are saying that Resolution D025 is really a statement of where the Episcopal Church is today. All I know for now is this. 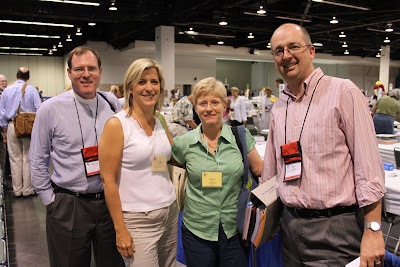 In September of 1985, just after I was ordained to the diaconate in the Diocese of Ohio, the General Convention also meeting in Anaheim elected the Rt. Rev. 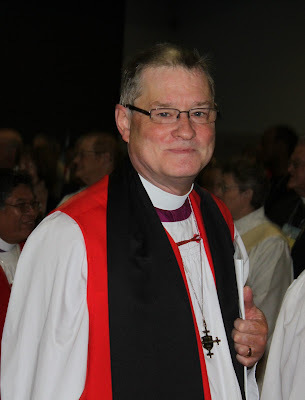 Edmund Browning as our 24th Presiding Bishop. 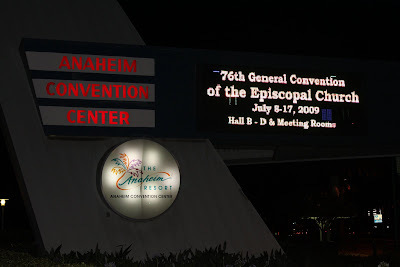 At the time of his election Bishop Browning made the following now famous statement: “There will be no outcasts in the Episcopal Church.” Now, 24 years later, the 76th General Convention also meeting in Anaheim reiterated and reaffirmed this policy by a 2/3 vote in all orders. Thanks be to God. I’m very grateful to be a part of the Episcopal Church at this time and grateful to be in the Diocese of Ohio. Thanks be to God. 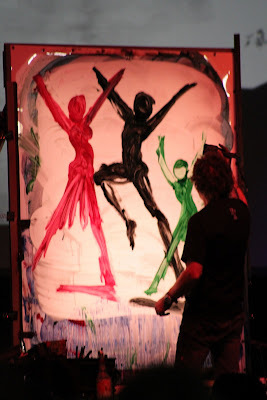 Please go to the ECW website--www.nationalecw.org--to read the complete Triennial Today every day. 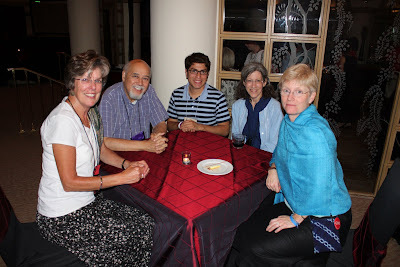 This will give you detailed reports on the Triennial Meeting, including pictures. On Sat. 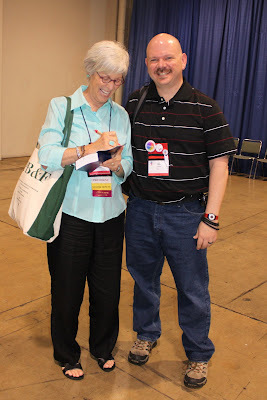 July 11th, the ECW's keynote speaker was Phyllis Tickle who in speaking to us on our theme--Grow in Grace--pointed out that grace is beauty--not something we earn; we can not make ourselves beautiful--we can do things to look pretty, but we can not make beauty. Jesus didn't speak about grace, but the angel's greeting was "Hail Mary, full of Grace"! 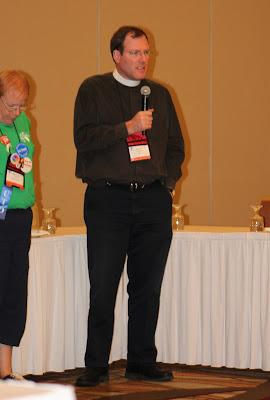 The ECW, as the largest network within the Episcopal Church IS working in so many ways in Growing in Grace. Phyllis Tickle also talked about Emergence Christianity & our current "Angli-mergence", the current very dynamic time in the life of the church. Later that morning we had our "Share Fair" -- with a dozen tables set up around the room displaying ideas for Outreach--with handouts that the delegates could take home. In the afternoon we had our first set of workshops, many with practical ideas for the delegates to use in their home dioceses & parishes. 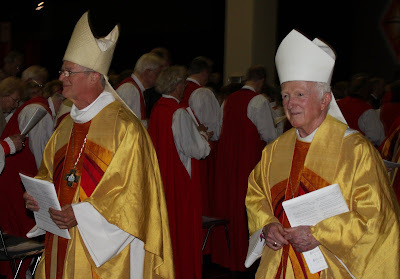 On Sunday, July 12th, we all attended the marvelous Eucharist where the House of Deputies, the House of Bishops, the Triennial Meeting and many visitors worshipped together with the Presiding Bishop as the celebrant & preacher. The United Thank Offering Ingathering is a part of this special service & Susan Lau, the UTO Coordinator for the Diocese of Ohio presented Ohio's offering. (see her picture elsewhere on this blog). A 2nd & 3rd set of workshops were held Sunday afternoon. Sunday evening we were all "blown away" with the performance of Elizabeth Von Trapp, all in support of the Jericho Road Episcopal Housing Initiative. Her voice & songs were not only wonderful, but she also spoke to us about her grandparents coming to this country & her subsequent concern about the victims of hurricane Katrina, in New Orleans. What a charming as well as such a talented woman!! She has offered to take her songs and story "on the road" in support of Jericho Road; so I will be working on bringing Elizabeth Von Trapp to Cleveland! The Communications legislative committee completed its work this morning, having perfected and adopted all our resolutions. One set of issues was difficult for us, because they arose out of some hard feelings among various constituencies in the Church. One of our members said that s/he didn't like the legislation because it had put our committee in the difficult role of "mediator," which is not our role. Another deputy on the committee said tome privately that good legislation never rises out of people's being "pissed off." I agree that good working relationships cannot be legislated. And trying to "strong-arm" other people through legislation is a really bad idea. However, as a tribute to our"formidable" process, our polity, we heard many voices telling hard stories. We tried to incorporate the underlying issues into our perfected resolution, and in some ways, we have managed to provide a bridge on which people of various opinion and perspective could talk and listen. We don't know whether the particular piece of legislation will even make it to the floor of Convention, but we believe that through prayer and the Holy Spirit, we have in fact done some real work that will last beyond our committee. It's a little bit of grace that shines through all of the activity and higher-profile issues. 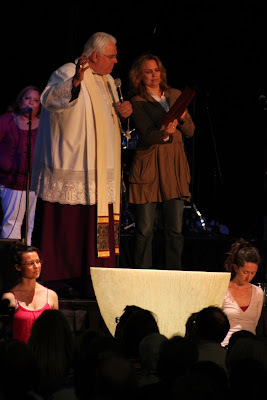 UTO Ingathering and Eucharist - July 12 The Most Rev. 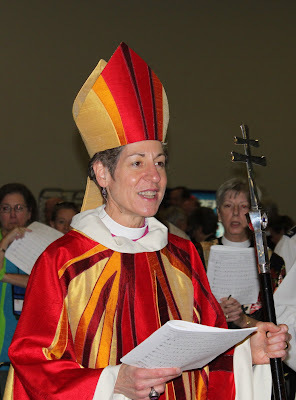 Katharine Jefferts Schori, Presiding Bishop and Primate of the Episcopal Church was the preacher and celebrant. The Rt. Rev. Barbara Harris and Denise Caywood at the Episcopal Women's Caucus Breakfast honoring the 20th anniversary of Bishop Harris' consecration as the first female bishop in the Anglican Communion and the 35 anniversary of the irregular ordinations of the Philadelphia Eleven.